Named after a rowdy white water kayaking section on the White Salmon River in Washington, the Little White is made for adventure. Your adventure, in fact. The Columbia River separates Oregon and Washington. 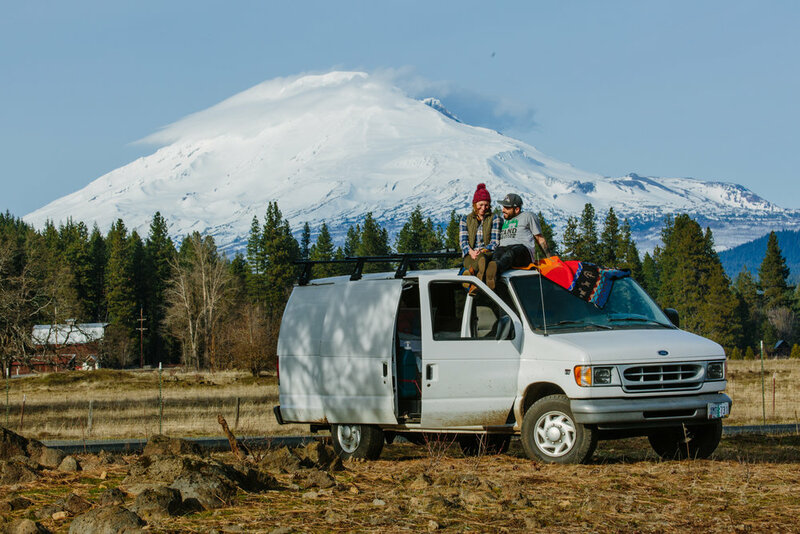 This Ford E350 Conversion Van has a diesel engine and high clearance; it was made to cruise down roads less traveled. The inside of the van has been converted into a camper's paradise. When it is time for bed, nestle into the super comfortable large queen+ bed and pull up the cozy comforter and soft blankets. Turn on the twinkle lights and it will feel like magic. Mountain bikes, surf boards, kayaks, skis - whatever your activity of choice requires - can easily be loaded onto the Little White, so don't hesitate to gear up for adventure. Little White will be ready to hit it as hard as you are. Bring Rover too. Little White is dog friendly. Cargo boxes are loaded with everything you will need to set up camp, including chairs, a hammock, camp table, Coleman stove, cooking supplies, a cooler, and much more. There's also an extra tent and sleeping bags if you decide you want to sleep under the stars. Either way, you'll get twinkle lights. Star light, star bright, where do you want to sleep tonight? To reserve Little White, simply click here or the Reserve Now link above.